Better Than Advil? What Your Doctor May Not Be Telling You To Help Your Pain. As I consult with corporate employees up and down the coast I get asked, “So why didn’t my doctor tell me about this?” To be fair, most primary care doctors are simply not educated in TENS technology. Therefor they do not know how or when it is appropriate to use. Other doctors are very busy and don’t have the time to screen, train, and educate after prescribing a TENS unit. Yet there are other doctors that know the benefits of TENS but choose not to prescribe them. If a patient can manage their pain on their own, they won’t need to come in for follow-up visits or therapy. Unfortunately, for some doctors, healthcare is strictly a business and prescribing TENS units means less chiropractic visits, less physical therapy, less epidurals, and less medication. Some of the smaller more mild units don’t require a prescription and can be bought online through ecommerce retailers of transcutaneous electrical nerve stimulation devices, while other, more effective units will need doctor approval before they can be purchased. 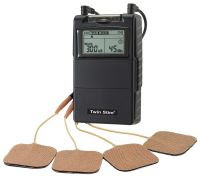 I do not recommend purchasing your TENS unit online. Unless you have experience with one, you want a trained healthcare professional to make sure you have the right unit with the the right settings for the best results.